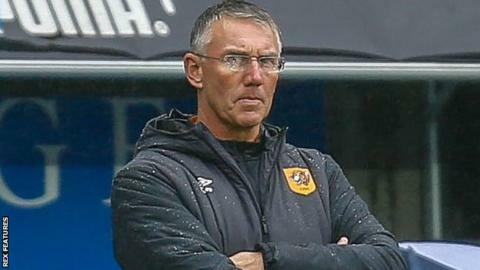 Hull City boss Nigel Adkins says his side were "terrible" in their 3-0 loss at his former club Reading - the Royals' first Championship home win since April. Sam Baldock reacted fastest to put the hosts in front after David Marshall had kept out Leandro Bacuna's attempt, before Jon Dadi Bodvarsson tapped home to make it 2-0 in the second half. Andy Yiadom's first Reading goal, a neat finish from inside the area, made the points safe with nine minutes left - although the Royals ended the game with 10 men as defender John O'Shea was shown a straight red card for a foul on Chris Martin. "For me, the players have been really good this season, but today's performance was nowhere near the level it has been," Adkins told BBC Radio Humberside. "We gifted Reading the impetus because we were nowhere near close enough on the one-on-one duels on the field of play." Victory for Reading, who had lost each of their past five games at the Madejski Stadium, will ease some of the growing pressure on manager Paul Clement. The win, only Clement's fifth victory in 19 games as boss, lifted the Royals out of the Championship relegation zone after nine games. Hull did have the ball in the net three times during the match, with Todd Kane and then Fraizer Campbell each flagged offside before a late Kamil Grosicki consolation was ruled out for handball. Adkins' side are now 21st and enduring their own poor run of form - they have won just twice this season and face the division's top two teams, Leeds and Middlesbrough, in their next two games before going to fourth-placed Sheffield United. "This was a big week, there were nine points up for grabs," added Adkins, whose side lost at Wigan on Tuesday having beaten winless Ipswich seven days ago. "On paper this was a better run of games than the next three we've got. "The players are well aware they've got to knuckle down, but for me that first half performance set the tone of the game." "A first home win, three goals and more importantly a clean sheet. "The players really worked hard for that and we're delighted after Wednesday's game (a 2-1 loss at home to Norwich City). "The biggest thing about Wednesday was the first half, the players were so disappointed and the players wanted to put that right. "From the first whistle the intent was there, the intensity was there, we got the early goal and that settled us down." Match ends, Reading 3, Hull City 0. Second Half ends, Reading 3, Hull City 0. Attempt missed. John Swift (Reading) right footed shot from outside the box misses to the left. Assisted by Tiago Ilori. Offside, Hull City. Todd Kane tries a through ball, but Eric Lichaj is caught offside. Hand ball by Tommy Elphick (Hull City). Substitution, Reading. Chris Gunter replaces Liam Kelly. John O'Shea (Reading) is shown the red card. Goal! Reading 3, Hull City 0. Andy Yiadom (Reading) right footed shot from the centre of the box to the bottom right corner. Attempt missed. Josh Sims (Reading) right footed shot from outside the box is close, but misses to the right. Assisted by Modou Barrow. Stephen Kingsley (Hull City) wins a free kick in the defensive half. Attempt missed. Eric Lichaj (Hull City) header from the centre of the box misses to the left. Assisted by Todd Kane with a cross. Attempt saved. Chris Martin (Hull City) right footed shot from the centre of the box is saved in the bottom right corner. Attempt missed. Reece Burke (Hull City) header from the centre of the box is too high. Assisted by Kamil Grosicki with a cross following a corner. Corner, Hull City. Conceded by Liam Moore. Goal! Reading 2, Hull City 0. Jón Dadi Bödvarsson (Reading) right footed shot from the centre of the box to the bottom left corner. Assisted by Andy Yiadom. Substitution, Reading. Modou Barrow replaces Sam Baldock. Substitution, Reading. John Swift replaces Saeid Ezatolahi. Foul by Saeid Ezatolahi (Reading). Substitution, Hull City. Chris Martin replaces Kevin Stewart. John O'Shea (Reading) is shown the yellow card for a bad foul. Delay in match John O'Shea (Reading) because of an injury.